Organisers of the 10th Ul­uinakau Rugby Sevens tournament 2019 received a major boost from their traditional sponsor Kombat Sportswear in Nadi yesterday. 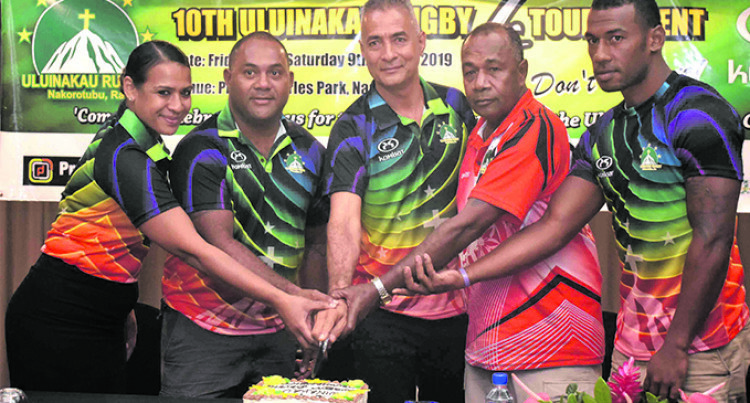 The tournament was officially launched together with their 10th anniversary celebration at the Tanoa International Hotel. Kombat Sportswear managing di­rector Koji Tokito, said their rela­tionship goes back a long way. “Our partnership has grown and now Uluinakau have their own 7s tournament,” he said. Uluinakau Rugby president Epi Kolinivala said it marks a signifi­cant chapter in the history of the club which was formed in the vil­lage of Namuaira in Nakorotubu, Ra. “We have evolved from a rural backyard 7s organiser to a high profile team’s competition in the urban centres. “After five years of hosting their tournament at the Nakorotubu District School ground, we moved to Ratu Cakobau Park, Nausori in 2012 and now to Prince Charles Park, Nadi where we know that we have majority support. “This is based on our kinfolk, and people who are related to us in the sports fraternity. Kolinivala thanked the corporate bodies for sharing their vision and willing to partner for the event which is on March 8-9. Uluinakau 7s head coach Male Kolinivala, said some players who were part of the team included France based- Setareki Bituni­yata, and Kaminieli Baisagele. Others are Ilikena Vudogo (Bris­bane Broncos), Meli Derenalagi, Vilimoni Botitu, Ilaisa Baisagele, Kaminieli Rasaku (Fijian U20) and Semisi Delana (now with Denman Devil RL, (NSW). Other sponsors are Prode Signs, Bumble Bee, The Hot Bread Kitch­en, Digicel, Tanoa International Hotel, Grand Melanesian Hotel and Drua.